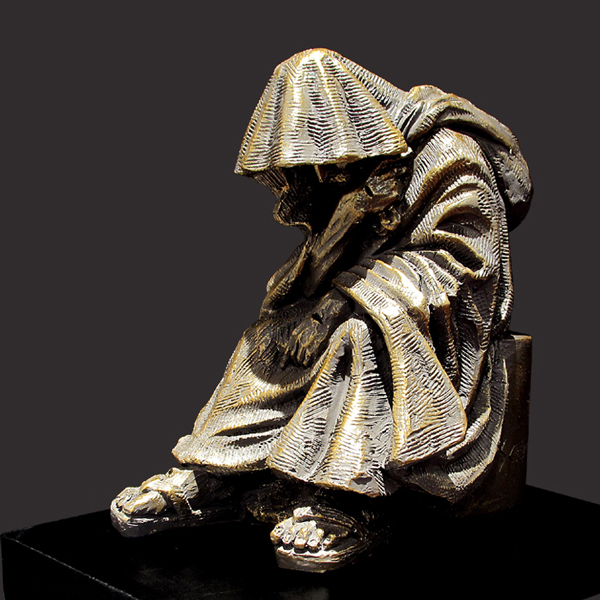 When I Was A Stranger by Timothy P. Schmalz is a highly detailed Christian sculpture that would make a wonderful conversation piece for any home decor setting. The image of Jesus is that of a vagabond or transient homeless with his life in a tattered bag on His back and reminds us that we are to welcome not alienate others from our social circles. If the piece is placed in a setting of seats it has the added benefit of being interactive with the viewer. This solid resin-stone cast is coated in a realistic bronze finish and is mounted on a solid matt black base. Timothy personally sculpts every original small masterpiece complete with his signature or monogram. Each replica is detailed by hand to the exacting standards of this modern day master sculptor.